I'll be waiting to see this one, for sure. Rideable dancing bear? Our dreams have come true. 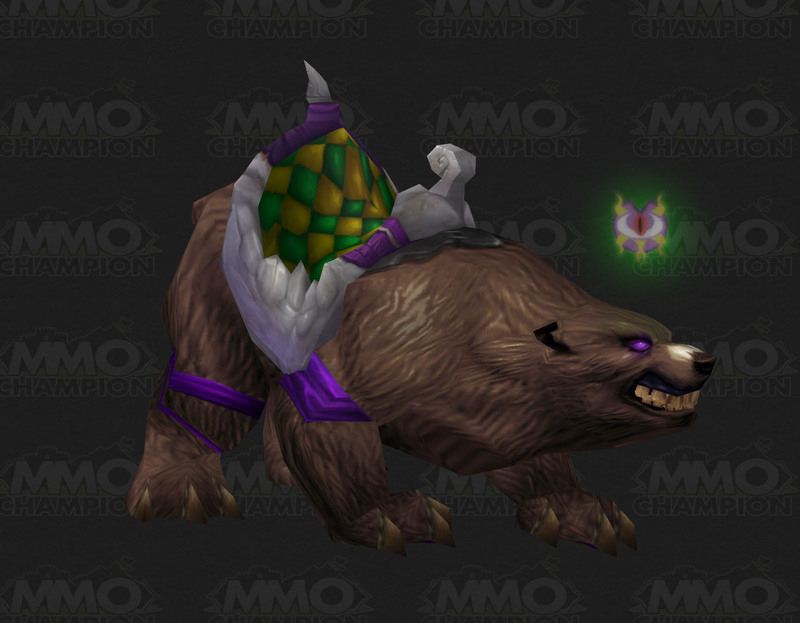 Blizzard Entertainement: Let's make the darkmoon faire mount a bear with a big glowing darmoon faire symbol floating in front of it, then everyone will know it's a SPECIAL DARKMOON FAIRE MOUNT and not a recolored version of Big Battle Bear! Most ground mounts roar or lift their front legs whilst pressing jump when not moving. Dancing bears danced on their hind legs. Non-moving jump = Bear dance? That be fun. Mock someone while on your mount. Don't what ever you do go to Borean Tundra with this mount and dance in front of the D.E.H.T.A. Encampment. Item tooltip shows it as Unique, so I am assuming we could possibly sell this. Wonder how much it would go for. 200k? A bear there was, a bear A BEAR! Depends on how hard it is to get. Edit: Don't understand the downvoting. It's a valid statement. Supply/demand, if it's easily farmable, the prices will drop, whereas if it takes a year long questline to get, the prices will be insane. And to the person below me, I don't think it had the BoP tag before. What? I thought that Captain Kangaroo video was AWESOME! EDIT: Jeez. I think people should have a cooldown on downvoting a comment. Comedy is hard people! This mount almost seems like it was designed for warlocks in full Nemesis. I'm in love. Naturally, the bear's /mountspecial is to stand up and do a little dance on its hind feet. Druid /dance style! It makes it look really, really hard to hold on to. It's absolutely adorable to watch, though! I can't wait to get my tickets for this one. available at level 20... and epic... run speed? does it run faster with the journeyman riding training... or at 100% at 20? is this available to ftp gamers? Is this new? Dancing mounts? We took a bear that had the freedom to dance on a stage, in front of a loving audience, and turned it into a personal taxi that has to dance at the whim of a single @#$%^&bag? Oh, and lets not forget the floating light that hovers inches from its face, forever illuminating the edges of every-single-one of the bear's waking moments. I'm pretty tired of blizzard thinking bear mounts are still awesome. Sure they kinda had a nice fresh feel when wotlk hit, but after 500 billion reskins. and 20 different kinds of bears. I think i can speak for all of us when i say... Blizzard needs to start coming up with new mounts and pet designs if they wanna make it worth weeks/months of farming. Look at all the different things they had in the zoo at dm island they could have used instead of a bear. Hell, id even take one of those mini ponies or rams, at least there sorta fun. It's possible to get this the 1st week. You can drop your main professions and pick up the other professions for the 4 tickets and get a guild group together or go early in the morning for the trinket. It's a common ugly brown bear; thank goodness I checked screenshots before grinding all the tokens. Only thing I don't like about this mount is the darkmoon symbol floating above it's head, it looks stupid. I wish that get on wotlk,cause that mount is for now is my favorite mount and that has will be popular mount and i will one day get that mount 4 ones for allllllllllllllllllllllllllllllllllllllllllllllllllllllllllll! 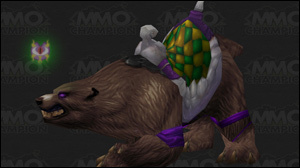 List of all the in-game bear mounts for the collectors out there! - Rédeas do Urso de Guerra Preto/Rédeas do Urso de Guerra Preto - Alliance/Horde - Achievement reward for Pela Aliança!/Pela Horda! - Grande Urso de Batalha - TCG loot item from Drums of War. - Grande Urso da Blizzard - BlizzCon 2008 Welcome package. - Urso de Batalha Amani - Timed run in Cataclysm Heroic Dungeon Zul'Aman. - Rédeas do Urso Marrom Encouraçado/Rédeas do Urso Marrom Encouraçado - Alliance/Horde - Bought from Mel Francis in Dalaran. - Urso Dançante de Negraluna - Purchased with 180 Darkmoon Prize Ticket. - Urso Guerreiro Amani - Required timed run in removed Zul'Aman raid. EDIT(s): Thanks a lot. Always confused the names of Zul'dungeons. I took it today! In total i did 8 days to take it! I can confirm that the non moving jump or /mountspecial is a little dance. It stands up on its hind legs and does a druid dance for a few seconds. Got mine today and I'm super happy with it. /Dance does nothing but /mountspecial does. The bear will rear up and do a few dance moves before settling down again. got this mount this morning. /dance does not work. simply jump while standing still to make it dance. Yes! he dances and all that with the TAB key! Everyone is jelly. It's literally a Dancing bear. A mount that dances !. This has got to be the best bear mount ever! It is like the Druid bear form but with someone on it ! Question, can you collect 180 tickets worth of Darkmoon faire quest items like Banner of the Fallen and cash them all in at once? Only trained professionals should attempt to ride a bear...and NEVER attempt this while in confined quarters! You know guys,why bear dancing every time? Maybe in darkmoon they drunk up bear and he's dancing every time because he is drunk. So,what you think guys? She's a "working girl". Tuck 180 darkmoon prize tickets behind her cute little purple garters and she'll be all yours! I Ride her all night. She's a lot of fun. Finally, my hunter has a mount with it's own scope! Just got this mount today and love it! How can you not love a dancing bear? :) To answer some questions I saw in other comments, the bear only dances a couple of seconds (/mountspecial or press spacebar). I wish it would dance and not stop until you move, like your character, but it's not a major drawback. Also, the grind to get 180 tickets was not that bad. I visited the DF for the first time in March. By the end of the second day of the fair in April, I had 185 tickets. There are 9 artifacts which you can turn in for tickets and rep, which can be found in dungeons, battlegrounds, and raids if you are carrying the adventurer's guide. All are usually available on the auction house too if you want to speed up the grind significantly. You get achievements for turning these in as well. Good luck! should i buy this, or the Swift Forest Strider? This is my favorite mount by far so far. I wish I could be in bear form on the back of it when I make it dance. How long does it take to farm that mount? For those who are wondering...this mount does indeed do the soulja boy & the dougie. Why is there no achievement for dancing with Kolin the dancing bear while dancing with this mount? There is still people out there who think bears don't dig on dancing. Funny effect occurs, if you bear dances under this effect. I usually use this in raid groups, standing with my back to the people. "These fearsome mounts have a habit of suddenly breaking out into dance amid battle, much to the annoyance of their riders." Does that mean he will randomly start dancing, or you need to click SPACEBAR to dance? The young animals are forced onto sheets of glowing hot metal and, in order to escape the pain, the bears alternate lifting up one paw and then another while a music is played. The process is repeated again and again until the animals automatically begin to raise their paws - to "dance" - in fear of the pain, even when there are no metal sheets. As the bears get older the trainers keep them under control by inflicting pain. They do this by putting rings through the bears' highly sensitive noses and jaws. No anaesthetic is used for this painful process. Chains are attached to the rings so that the trainers can control the animals, which weigh up to 350 kilograms, with only a slight tug on the chains. The bear’s claws are trimmed several times a year and their teeth broken or removed so they can’t injure their trainer. The bears also suffer with an inadequate diet that usually consists of white bread, sugar and alcohol. All these cause serious physical health problems for the bears. Many also display stereotypic behaviours such as swaying and pacing and self mutilation as they can’t follow natural behavioural patterns and instincts. Not something I EVER want to see in real life. Nice mount though, easily obtainable from the DMF. if Blizz added these to BMAH Pochete de Cupons de Negraluna, but rarely pop on BMAH, instead they waste slots with stuff like Transportador de Gato (Siamês) on AH for 1000 gold start which is sold by a vendor for 60 silver. The darkmoon dirigible shares the same data with the dancing bear. I wonder if they are gonna delete the bear mount. These can be found in battlegrounds and dungeons with the Guia do Aventureiro de Negraluna, or found on the Auction House. "Estes ursos costumam ter surtos dançantes no meio da batalha, causando profundo aborrecimento a seus cavaleiros."